In 1950, Canada overprinted stamps from its 50c Oil Wells Issue of earlier that year 'O.H.M.S." for official use (Scott #O11). 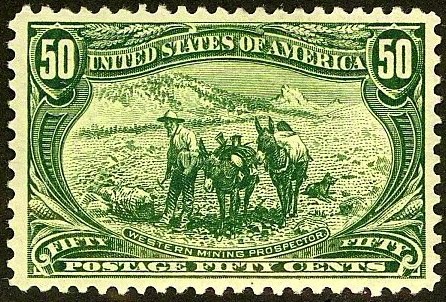 95,000 were issued, and Scott '14 prices the unused stamp at $40.00. Because the market for modern Canadian high values has been weak of late, it is possible to find O11s in VF NH condition offered at 25%-35% of Scott. I believe that the undervaluation of this stamp is due to its having been overlooked as an obscure back-of-book issue. Many were probably used as postage by government offices, and then discarded. Interest in stamp collecting in Canada is much stronger than it is in the U.S., and I favor better B.N.A. stamps for investment, especially if they had modest printings and have been unjustifiably overlooked thus far. With a population of about 31 million, Canada is one of the world's wealthiest countries, and one of the world's top ten trading nations. GDP growth has averaged 2.2% over the past five years, which takes into account the 0% growth of 2009 due to the global financial crisis. Canada's population is expected to age significantly over the next decades, thereby bolstering its population of serious collectors. Canadians over 60 are projected to increase from 16.7% of the population in 2000 to 27.9% in 2025, and 30.5% in 2050. Consequently, in the future, many more Canadians will be spending time working on their stamp collections on cold winter days. Scott and Unitrade publication put ridiculous high price on some easy to find stamps and will put a small value on a scarce stamp, and Unitrade is not better, they just copy Scott. There would be easily more than 500 stamps that would need revision, especially on very recent stamps. And they should put IN BOLD on many pages that the stamps need to be in perfect condition, no wrinkles, crease, thin, ect..... So many sellers would put "Very Fine" or "F-VF" on stamps that has an obvious visible defect. And Unitrade should start having a value for Very Fine, for the moment on Unitrade, it is only Fine value, but Very Fine is hard to find on modern stamps, mainly due to stamps sellers having a large quantities of stamps at work and soaking the stamps not knowing how. I had to stop purchasing Canadian stamps off-paper because 75%+ of the recent stamps are badly soaked.